Seattle is one of the best places in the world for coffee. And no, i’m not talking about Starbucks. When I meet people who are planning on visiting the Emerald City, my biggest piece of advice is to check out the local coffee scene. Coffee shop owners in Seattle put a lot of love and attention into their coffee. Many coffee houses in Seattle roast their own beans or buy from a local roaster. You can find coffee beans from Honduras to Rwanda and they all taste totally different. Here is a small list of a few cafe’s I have been able to sample during my time living in the Seattle area. When I first moved to Seattle in 2009, I had not quite come to appreciate the vibrant coffee culture the city was famed for. 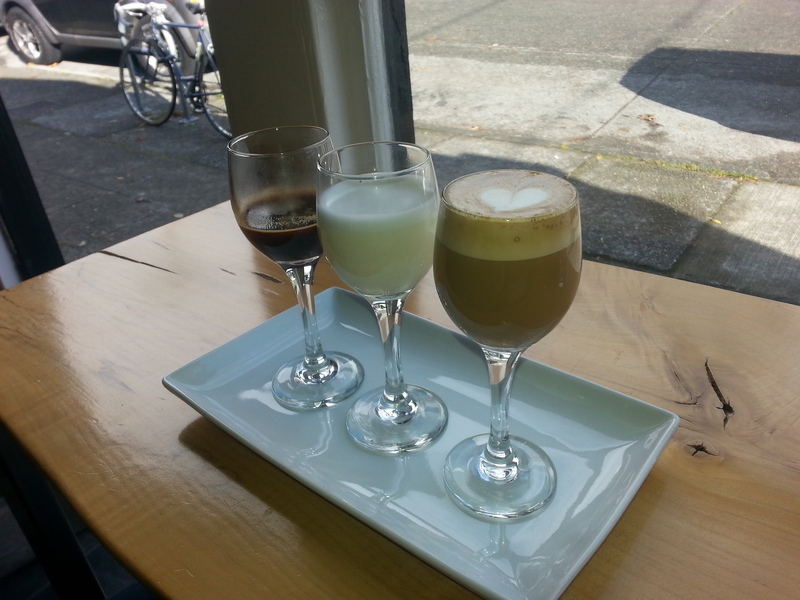 But, then an old friend took me to Espresso Vivace on Capitol Hill and so my education began. Vivace is something of an institution within the Seattle coffee community. They have served Seattle since 1988 and they roast their coffee beans on sight at their flagship store on Capitol Hill. My favorite coffee drink to get there is the Cafe Nico. This is a very rich drink that comes in a 4 oz or an 8 oz and is essentially a breve (half cream and half milk) macchiato with orange zest and cinnamon. However, it’s definitely more of an afternoon pick-me-up than morning fuel. Milstead & Co. coffee is located in the artsy neighborhood of Fremont, just down the hill from the famed Fremont Troll. I first went there last summer in the middle of a heatwave and was immediately impressed with it’s rotating selection of roasted coffee and it’s outdoor seating area which features a large piece of the Berlin Wall. Okay, the piece of the Berlin Wall actually belongs to the historic society next door that also shares the space but it’s still a very cool feature. 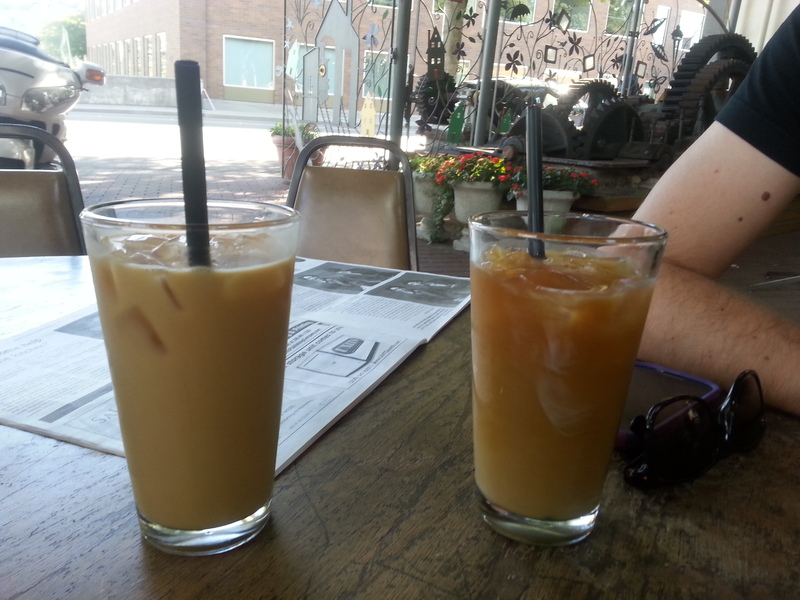 Milstead’s cold brew coffee served over ice in a large pint glass was the perfect thing to kick the summer heat. If you aren’t feeling up for coffee their burnt sugar lemonade/iced tea over ice is also pretty noteworthy. A “de-constructed latte” from Slate. Espresso in one glass, steamed milk in the second and a latte in the third. Slate was a coffee place that was a huge disappointment the one and only time I went. I was immediately put off by the fact that rather than being a coffee house the place had the atmosphere of a cramped wine bar that happened to serve coffee. While you can pick up a coffee to go, if you choose to stay and sit in the cramped quarters of Slate you soon learn that they have table service — which is unnecessary since the place is so small and isn’t a restaurant. This means that you are obligated to tip the wait staff for a cup of coffee. The coffee, while just as good as any in Seattle, isn’t exactly mind-blowing or offering anything different to what you have tried before. This makes the fact that they charge you $4-$5 for a cup of coffee that comes served in a 6 oz wine glass even more ridiculous. Overall, the place wasn’t worth the money or the time. 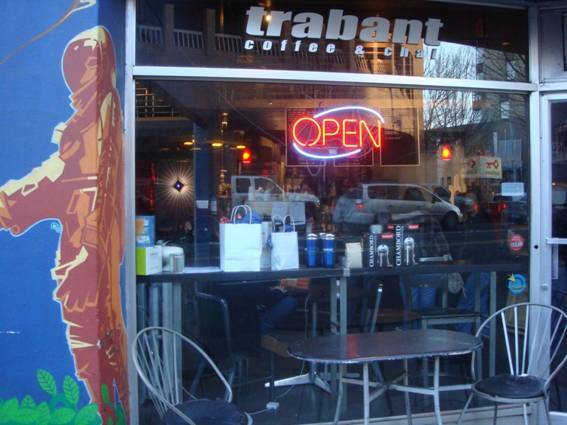 Trabant was not one of my main stops for coffee when I lived in the U-District. It’s known as one of the best places to get a chai tea in the city. I don’t like chai tea so I never bothered to go there until I got my first big job out of college. The bus I had to catch in the early hours of the morning stopped directly in front of Trabant. It soon became the place to go to when I was running late and hadn’t had time to grab breakfast or coffee.I soon realized that while Trabant is famed for their chai tea– they were no slouch when it came to espresso. Then one morning I was running VERY late. I quickly ordered a non-fat latte and a chocolate croissant to go. Just as the barista finished my coffee — my bus pulled up outside the door. I would either have to pay and miss my bus or leave my order and run for it. The barista took one look at me and shoved the coffee and croissant into my hands and said “Go! Don’t worry about it!”After that, the coffee and the staff totally won me over. Trabant has continued to do well for itself in the years since. They have solidified themselves as a go to place for coffee in the U-District neighborhood and have opened a second location in Pioneer Square. Next time you are in Seattle, indulge in one of the city’s favorite pastimes and enjoy a very high quality cup of joe! < Another Move, Another City!